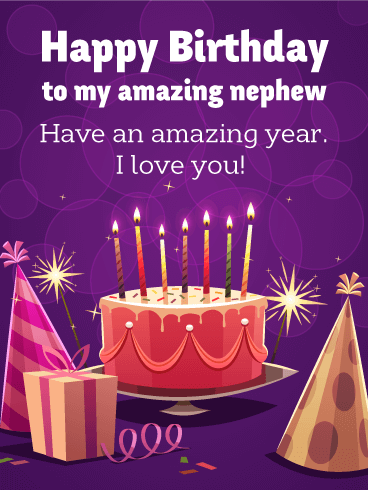 A special nephew deserves the biggest & brightest birthday wishes, which are captured here in this card! A rich green lighted background and a chocolate cake topped by a sparkler create the ultimate party setting while letting him know you're thinking of him and hoping he has a celebration beyond compare. A finely polished cake! This cool birthday card for a nephew is really great in teal and gold, turquoise and pea green colors for a modern-vintage feel. 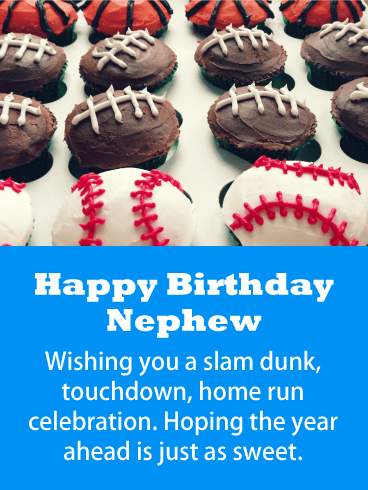 This hip birthday greeting is a great way to wish your nephew a happy birthday. 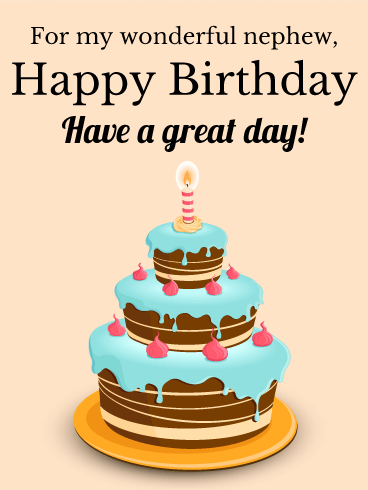 Small gestures go a long way, and this special birthday card is sure to be a treat. The smooth frosted cake is chock-full of candles, so all his birthday wishes can come true! A birthday cake with all the yum! A birthday card with all the fun! 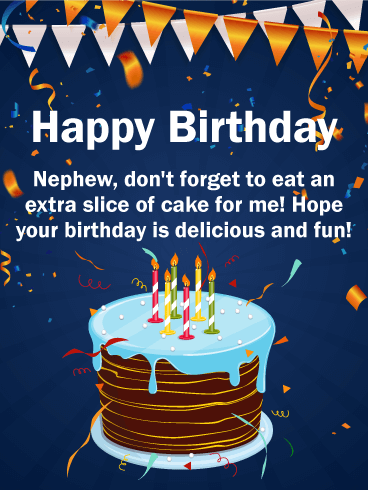 Send this scrumptious birthday greeting to your wonderful nephew and make his day. A towering chocolate cake drips with blue frosting-if only it was real! But your good wishes are real, and your thoughtfulness is a great gift on your nephew's special day. 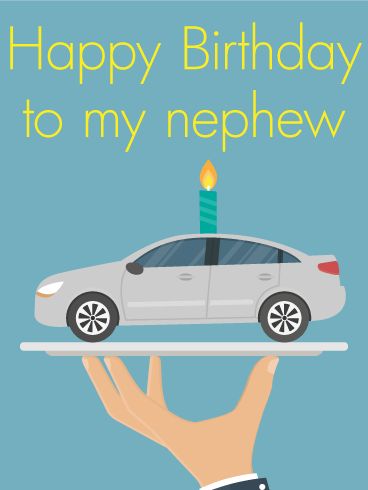 Treat your nephew to this fun birthday card. Cake? Check! Confetti? Check! Candles? Check! Looks like we have the perfect recipe for a great birthday card right here! Your nephew will love this colorful birthday card. Let him know he is amazing and make his special day really rock. A rainbow of confetti never fails to please, and this chocolate birthday looks good enough to eat. 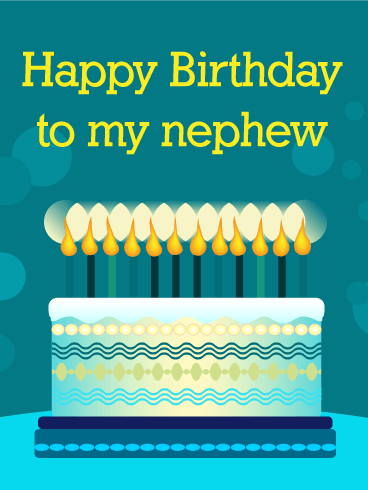 So send this festive birthday card to you nephew today! Nephews love cupcakes too! 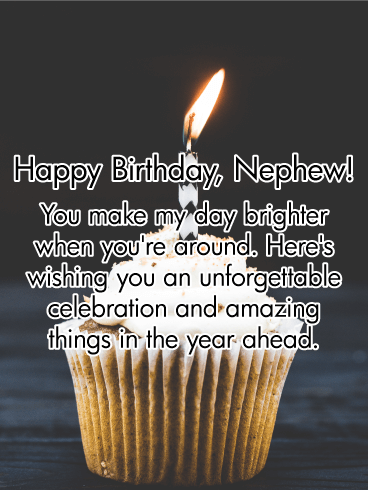 Send a bright and festive birthday card full of neon cupcakes and dazzling sparklers to your special nephew today. 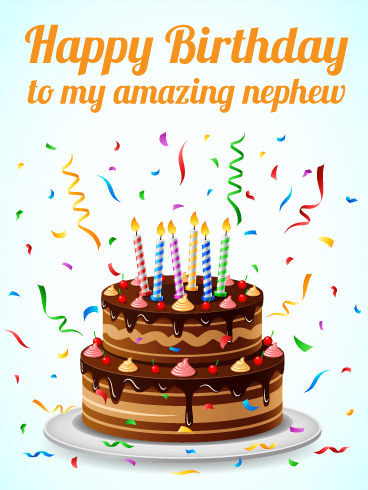 Wish your nephew a happy birthday with a fun card that he will really love. This birthday greeting card is almost good enough to eat with purple, green, blue, yellow, and pink cupcakes glowing with sparklers. So make a wish and treat your nephew to thoughtful birthday card. 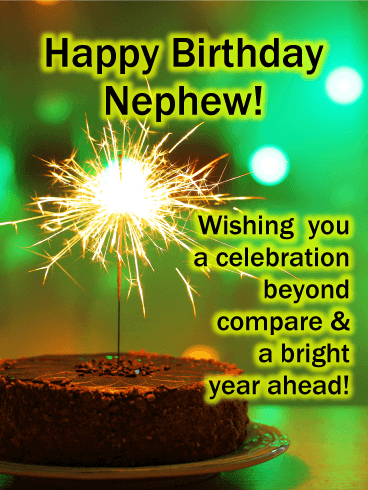 For the nephew that really shines, send a birthday greeting full of sparklers and good wishes. 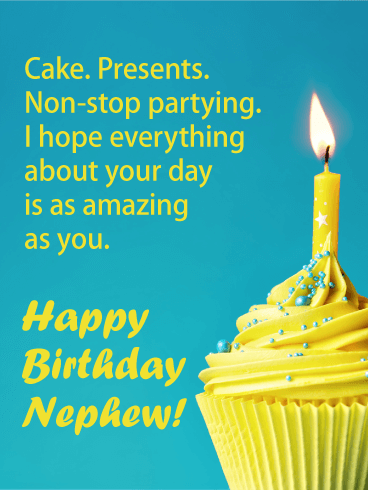 This festive birthday card is perfect for a nephew who really stands out. Let him know you think he is brilliant on his birthday and every day. 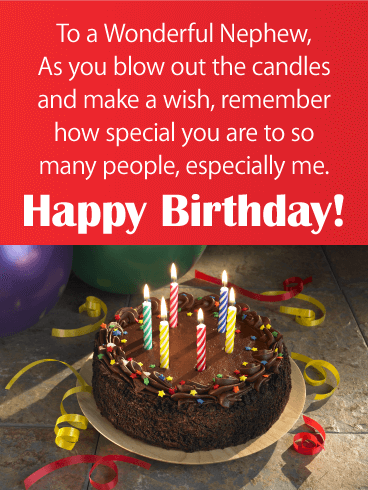 This birthday card is lit up with glowing birthday candles and celebratory sparklers for a birthday greeting that is sure to be a hit. 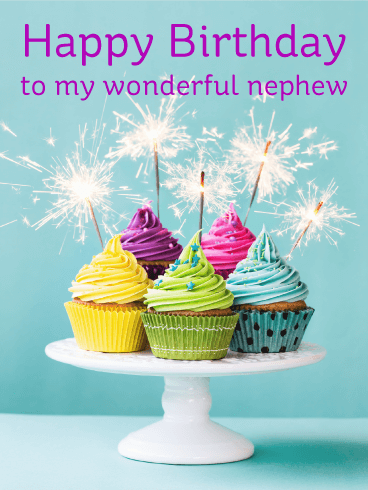 A birthday bash celebratory card for your favorite nephew is the best way to say happy birthday! A present, party hats, and a yummy cake say "I love you" in the best way possible! 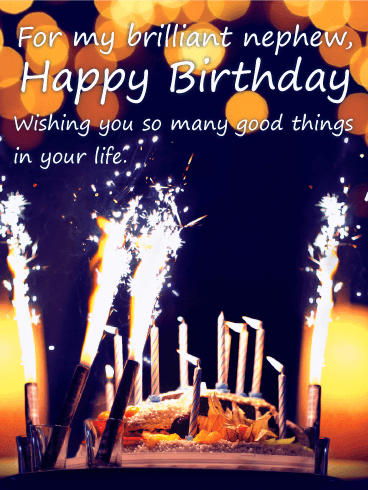 Send him this birthday card with a special message and you'll make his birthday even happier!